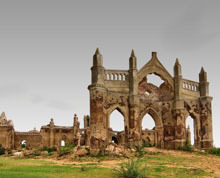 Headquarters of the district of the same name in Karnataka, Hassan is rich in history and brimful of culture and heritage. This relaxed and laid-back fourth largest city in the state derives its name from Goddess "Hasanamba" and is a refreshing change from the far more touristy sites in the state. Once the bastion of the Hoysala rulers, who were great temple builders, the district of Hassan, not surprisingly, boasts wonderful architecture, temples and a wide array of attractions. What makes Hassan a compelling destination is its being the most convenient base for visiting the world-renowned heritage sites of Belur, Halebid and Sravanabelagola which are located in the district. Built the Krishnappa Nayaka (Paleghar), the 12th century legendary Hasanamba Temple enshrines Goddess Hasanamba. The beautifully sculpted shrine is opened for the devotees only for eight days in a year during the Hindu month of Ashwayuja (usually late Oct - early Nov). During the period devotees throng the shrine in large number to have a darshan of the deity. 10 km from the Hassan city, Koravangala is home to the Bucesvara Temple, one of the many finest temples built during the Hoysala reign. Also spelt Bucheshvara or Bucheshwara, the temple was built under the patronage of a Hoysala vassal named Buci to commemorate the coronation of Hoysala ruler Veera Ballala II. One of the fine specimens of the Hoysala School of architecture, Nageshvara-Chennakeshava Temple complex is located at Mosale, located in the Hassan district. Some 10 km from the centre of the Hassan city on the Hassan-Mysore road, the temple complex houses two shrines dedicated to Shiva and Vishnu. A serene weekend gateway from Hassan, Rosary Church is situated in the picturesque village of Shetti Halli. During monsoons the church gets submerged under the waters of the Hemavathy River. By Air: The nearest airport to Hassan is Mangalore which is 172 km away. Airlines operate flights from Mangalore to Bangalore, Chennai and Mumbai. By rail: Lying in the South Western Railway zone of the Indian Railways, Hassan City is a railhead connected with different places in India including Bangalore. By Road: The Karnataka State Road Transport Corporation (KSRTC) operates regular bus services from Hassan to other important places in the state. Major cities and towns near Hassan connected with it by road are Chikmagalur (65km), Mysore (115km), Mangalore (172 km) and Bangalore (186 km). Hassan has got a number of suitable accommodation options. Hotel Southern Star, Suvarna Regency, Ashhok Hassan and Hoysala Village Resort are some of the hotels in Hassan. 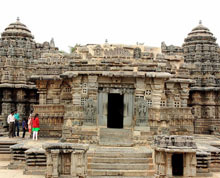 Halebidu is a must visit excursion site from Hassan. Located in the Hassan district, Halebid, formerly called Dorasamudra or Dwarasamudra, is famous all over the world for being the place where some of the finest temples built by the Hoysala rulers are located. Dorasamudra, the grand capital of the Hoysala dynasty was plundered by the armies of Alauddin Khilji of the Delhi Sultanate under the generalship of Malik Kafur. Hoysaleswara Temple and Kedareswara Temple are two famous shrines of the Hoysala school of architecture located in Halebid, which is 33 km from Hassan city. Within the premises of the Hoysaleswara Temple is located a sculpture gallery maintained by the Archaeological Survey of India. Halebidu can be reached by good morotable roads from different places like Bangalore, Belur, Hassan, Shravanbelgola and Mangalore. 17 kms from Halebidu and 38 km from Hassan city is located another site named Belur which is known for the awe-inspiring Hoysalan Chennakesava Temple. Situtaed on the banks of the river Yagachi in Hassan district, Belur was the centre of power of the Hoysala before Halebidu. 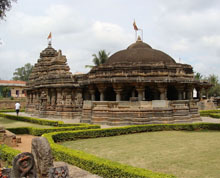 Veernarayan Temple and Kappe Chennigaraya Temple are other famous important monuments in Belur. Located in the Hassan district, Sravanabelagola is a famous pilgrimage site of Jainism. 48 km from the Hassan city, Sravanabelagola is renowned for its imposing statue of Gomateshwar, also referred to as Lord Bahubali. 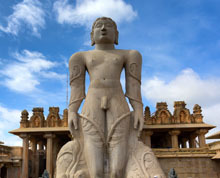 Carved out of monolithic stone, the awesome 17 metre high statue can be seen from a distance of 20km.